I’d like to ask you, Tomie-san, how do you go about writing a script for a dungeon-based RPG in which players could be said to be battling against themselves? Dungeon-based RPGs are games in which skilful players can clear dungeons with ease. This can make incorporating a story very difficult. I remember having real trouble with this while working on the first Shiren the Wanderer, in particular. You’ve got to work according to the premise that not all players will have the same fixed experience, haven’t you? That’s right. Having said that, I think that in the case of the Mystery Dungeon series, the system is the story. Well, in an ordinary RPG, players cannot acquire powerful weapons until near the end of the game. In Mystery Dungeon, however, because the map and items change every time a player enters a dungeon, the randomisation process can mean that a player suddenly finds the most powerful weapon of all right at the start of the game. From that moment on, their story is going to be very different for that player. Because they are able to push deeper into the dungeon? Yes. In other words, their story has changed because of the game system. As the script writer, I took great care to make sure I didn’t damage this feature. A script that works closely alongside a randomly generated story… that’s rather different from most ordinary games. 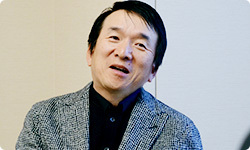 Having made the first Pokémon Mystery Dungeon game in this way, what response did you experience, Nagahata-san? I was surprised at how well the game was received by Pokémon fans. That was unexpected. Of course, we had the story and the charming characters on our side, but the structure of the game itself is actually rather different when compared to an ordinary RPG. A special group of people who were aware of the joys of dungeon-based RPGs always existed, there’s no doubt about it – that’s why we have words such as ‘Shi-Ranger’9. After Pokémon Mystery Dungeon was released, however, their number increased rapidly. You must have felt you’d achieved what you wanted to achieve, Ishihara-san?9. Shi-Ranger: A nickname given to passionate fans of the Shiren the Wanderer series and Mystery Dungeon titles in general. Yes, I did. 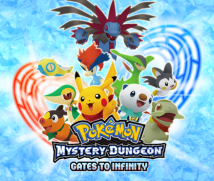 The fact that fans of both Pokémon and Mystery Dungeon thought that this seemed like an interesting title justified our collaboration. After the first title was released, you developed three titles for Nintendo DS: Time, Darkness, and Sky10. What did you have in mind when developing these titles?10. Time and Darkness: References to Pokémon Mystery Dungeon: Explorers of Time and Pokémon Mystery Dungeon: Explorers of Darkness, the second titles in the Pokémon Mystery Dungeon series, released for Nintendo DS in September 2007 in Japan and July 2008 in Europe. Pokémon Mystery Dungeon: Explorers of Sky was the next entry in the series, released for Nintendo DS in April 2009 in Japan and November 2009 in Europe. Well, we wanted to include more new Pokémon and have a more dramatic storyline. Also, the first title was developed with the Game Boy Advance as the base system. For the second round of titles, we switched to using Nintendo DS as the base system. If I may add, the first titles were developed during a period of hardware transition, from Game Boy Advance to Nintendo DS, so the Blue version on Nintendo DS was based on the Game Boy Advance version’s structure. For the second titles, we really made the most of the potential of Nintendo DS. The new title is being released on Nintendo 3DS. 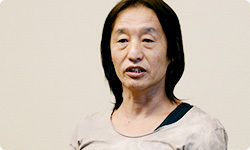 What have you been devoting your energies to this time around, Nagahata-san? In general, I was keen to use all of the capabilities of Nintendo 3DS and I think we largely managed to achieve that. The Magnagate11 feature, which uses AR technology12, is an example of this. We also use the motion controls in a treasure-hunting mini-game.11. Magnagate: A feature of Pokémon Mystery Dungeon: Gates to Infinity that uses the outer cameras of Nintendo 3DS. Scanning a circular object with the outer cameras of your Nintendo 3DS system allows you to open a completely new dungeon entrance, known as a Magnagate, within the game.12. AR technology: Short for augmented reality technology. It involves combining virtual data with real-life images. What have you done in terms of wireless communications? Players can play with each other either competitively or co-operatively. For example, players can work together to defeat big bosses according to the same single-player rules of Mystery Dungeon. And that’s enjoyable in a completely different way to doing it alone, isn’t it? Having said that, as more and more entries are added to the series, you need to make sure that players are challenged and don’t feel they’re getting stuck in a rut. How did you approach this issue from script-writing point of view, Tomie-san? Well, classic stories are easy to understand. To put it bluntly: there is justice, there is evil, the world is in danger, a hero appears to save the world, the world is saved, everyone’s happy... that kind of pattern. (laughs) That certainly is putting it bluntly! I suppose it’s difficult to make a story like that into something more subtle? Yes, it is. It’s crucial that your stories remain both unpredictable and plausible. It’s difficult to make very common stories interesting. Having said that, if you do pull off a classic story successfully, it’s one of the most powerful types of story there is. That’s why it’s something I’ve tried to do throughout the Pokémon series. 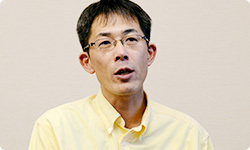 Did you suggest some themes or topics in your role as producer, Ishihara-san? Well, I did really want to include some kind of AR feature. And that takes the form of the Magnagate feature that Nagahata-san mentioned, doesn’t it? Yes, that’s right. I wanted to create a system where scanning something using AR causes the nature of a dungeon to change, but also using AR in a way similar to what we did with Pokémon Dream Radar13 and Pokédex 3D14. For example, there may be a manhole cover near you that looks just like a dungeon entrance. I wondered whether we could create a game in which players would think “The monsters in that sewer are really tough!”.13. Pokémon Dream Radar: A downloadable title for Nintendo 3DS in June 2012 in Japan and October 2012 in Europe. Pokémon appear in a player’s real-world surroundings, displayed using the camera of Nintendo 3DS, and must be captured using a beam. Captured Pokémon can be transferred to a player’s Pokémon Black Version 2 / Pokémon White Version 2 game.14. Pokédex 3D: A downloadable title released for the Nintendo 3DS in June 2011. It allowed players to view their 3D models of their favourite new Pokémon from Pokémon Black / Pokémon White from whatever angle they choose. Pokédex 3D is no longer available for download, but an upgraded version called Pokédex 3D Pro can be downloaded from Nintendo eShop. Could you explain the process of trial and error that allowed this concept to develop into the current Magnagate feature? First of all, we looked at various patterns and shapes and did some research into whether these patterns could be tied to a dungeon’s difficulty level. We tried using squares and triangle, before finally settling on circles. So, how is a dungeon actually created when a player scans a circular object? The type of dungeon that is created is determined by factors such as the size and colour of the round object that is scanned. A dungeon’s visuals are determined by the object’s colour, and its difficulty level is determined by the size of the object. And what kind of response did this get from the team? I can certainly imagine that children will start looking for round things to scan and drawing circles of their own too! I agree. I hope they do play like that and experience a new kind of stimulation.